An 8-week-old puppy, newly weaned from his mother, needs physical and nutritional care as well as lots of love and attention from you. Have all of your necessities in place before bringing him home, such as bedding, toys, leash and food. If possible, try to set aside a few days to spend with your pup when you first get him to acclimate him to his new environment and help him bond with his new family. Establish a relationship with a vet early on to ensure you have a go-to resource for your puppy’s health care needs. If you got papers with your puppy indicating dates of worming or early vaccinations, take that to your vet. He’ll advise you on a shot schedule that typically includes a series of vaccinations between 8 and 16 weeks of age. These include vaccinations to prevent parvovirus, rabies, distemper and hepatitis. Different puppy breeds have different nutritional needs. Your vet is a good source for recommending an appropriate, nutritionally balanced diet. If your pup was starting to transition from mother’s milk to solid food, keep him on that same routine. Follow the food serving guidelines on your commercial dog food and moisten dry food with water. Several small meals a day will sit better with your pup’s developing digestive system than one or two large meals. Early crate training keeps your pup safe, helps with housebreaking and creates a comfortable den-like environment he’ll feel safe in. Puppies need lots of supervision in their early weeks and months, and a crate can help ensure his safety, especially if you aren’t around. Don’t crate him too long -- puppies can only hold their bladders and bowels for a short period, and they need social interaction and play time with you. Buy a kennel that will be large enough to hold your dog comfortably when he reaches full size. It should be big enough for your dog to stand up and turn around. Some crates come with dividing panels that allow you to alter the size as your pup grows. Get your puppy used to a leash and collar with ID tag as soon as you bring him home. Getting into consistent routines with your pup will help establish house rules and assist in potty training. Even though young pups are full of energy and don’t have long attention spans, you can begin issuing simple commands such as sit, stay, come, outside and no. 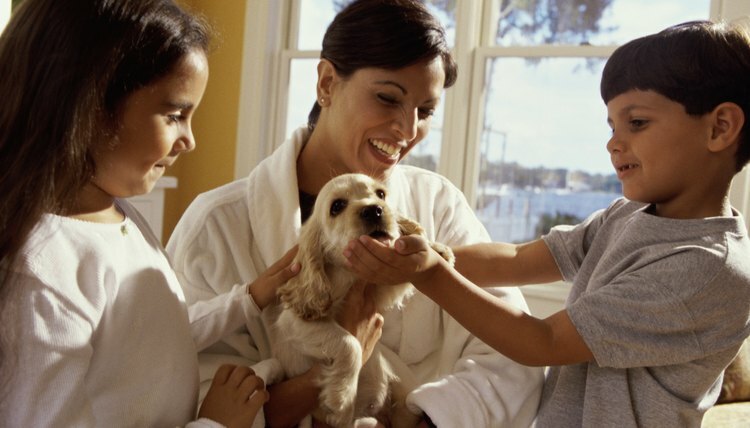 Never scold or hit your puppy -- it will only build mistrust. Give your 8-week-old puppy lots of love and attention, but don’t overwhelm him with too many people, places, sights or sounds. Early socialization can be valuable for you and your pup, but your vet will tell you when it’s OK to take him into public settings. You’ll want to ensure he’s built up full immunity from his vaccinations. What Is the Development of a Golden Retriever Puppy?